We are studying Solomon today. Much of the reading is taken from 1 Kings but a comparative reading can also be found in 1 Chronicles 1-9. If you were to be granted one wish. Just one. Anything you want. What would it be? Now if a 20 year old had just one wish what do you think they would ask for? "In Gibeon the Lord appeared to Solomon in a dream by night: and God said, Ask what I shall give thee." In a small survey a few years ago, over 70% of teenagers when asked what they would want if they had one wish, said they wanted money, wealth or material possessions. What did Solomon ask for? Read 1 Kings 3:6-9 "An understanding heart." Somewhat overwhelmed by all the people he was now responsible for, he sought this gift not for adoration or recognition but so that he may discern between good and bad to judge the people righteously. We see this humility time and again from servants of the Lord, this recognition of their own inadequacies and their need to rely on the Lord's gifts. Do you think having this wisdom of God would be useful in work, in families and in church? How might we be able to get this gift of wisdom and an understanding heart? On a side note you may have noticed the description of Gibeon in those verses and wondered why it claims the title of "the great high place". As we know there was no temple in those days and so altars were built upon the mountains which were considered holy places themselves. David built a tabernacle in Jerusalem to house the Ark of the Covenant but the original Tabernacle of Moses that had been built in wilderness was, in the time of Solomon, set up at Gibeon. This tabernacle was held with great esteem for obvious reasons and thus was considered "the great high place". It was essentially the equivalent of our modern day Salt Lake City Temple. It was not the only "high place" whereby the people of Israel could go and make offerings but it was held in great esteem among all the high places. The clear example of Solomon's wisdom is now infamous. Two prostitutes claim a single living child is theirs. Solomon carefully watching the body language and reaction of the two prostitutes deduces the true mother. Solomon is rightly considered wise but I wonder if he is remembered as wise for the wrong reasons. Not to suggest solving this very emotional and tough personal drama was easy but I suspect we may miss the point. Solomon's wisdom was not shown through the decision he made but rather through the fact that he even heard the case. Here is Solomon. He is the King. He has just spoken with God. He has just offered sacrifices at the two most holy places in the Kingdom - the tabernacle of Moses at Gibeon and the tabernacle of David in Jerusalem. Why would Solomon then lower himself to discuss a private squabble between two unworthy and unclean prostitutes. Therein lies the true wisdom of Solomon (and of God). True wisdom recognizes that we are all equal in the sight of God. We all are his children. Just because our choices are righteous and other's choices are unrighteous does not mean we treat others differently. Solomon recognized this and in choosing to hear this case of the two prostitutes he sent a clear message to his people that he was concerned for all of his people and that he would be fair in his judgements. Likewise God too loves us all, righteous or unrighteous. Even the lowest of us all will have their chance to plead their case before God. And we can feel sure that we will be judged righteously and fairly. Solomon had heard of the prophecy and decided to fulfill it. Sometimes I wonder if we wait a little too much for prophecy to be fulfilled by God or by others. How might we each be able to fulfill prophecy today? "Those willing to exercise faith in the Lord Jesus Christ and to follow His latter-day prophets will not be content to merely watch these things happen. Motivated by our love for the Saviour and all of the Father’s children, each one of us can all help to make things happen." 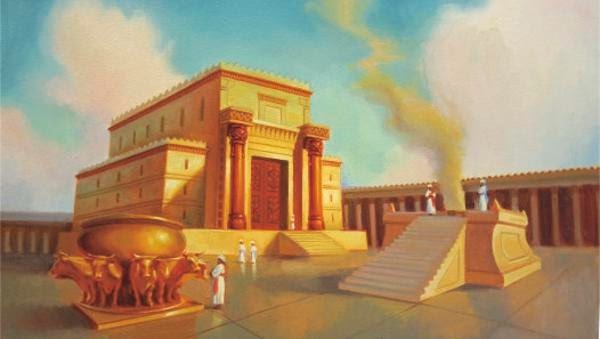 How many others helped fulfill the prophecy of the temple being built in Jerusalem? Clearly many people were needed to build the temple in Jerusalem. Likewise, here today we are all enlisted in this great work. We are all needed to help fulfill the prophecies of the last days. "And the house, when it was in building, was built of stone made ready before it was brought thither: so that there was neither hammer nor axe nor any tool of iron heard in the house, while it was in building." What does this tell us about how Solomon and the people felt about the temple? Can you imagine the extra sacrifice and effort that took? Some may have considered this an unnecessary inconvenience when the building had not yet been constructed and dedicated. Do we have similar situations today where worldly logic defies spiritual logic? It puts me in mind of the great sacrifice Hannah made. Before Samuel was even born into his mortal temple, he had been dedicated to the Lord. These acts are not within the basic gospel requirements. Such acts stand above the basic requirements and mark out those among us who have the greater faith and desire. They are to be honoured and held up as higher examples for us all to aspire to, like stepping stones of faith in our upward journey to become like Him and as Him. "...if they bethink themselves...and repent, and make supplication unto thee...And so return unto thee with all of their heart, and with all of their soul, and pray unto thee toward their land and the house which I have built for thy name: Then hear thou their prayer and their supplication and maintain their cause and forgive thy people that have sinned against thee and all their transgressions wherein they have transgressed against thee"
There isn't a soul among us who has not made a wrong turn, a bad decision or a foolish choice. But there is power, healing power to be found within the covenants of the temple when coupled with true repentance. For the temple is a house of God, A place of love and beauty." "I Love to See the Temple"
“In the peace of these lovely temples, sometimes we find solutions to the serious problems of life. Under the influence of the Spirit, sometimes pure knowledge flows to us there. Temples are places of personal revelation. When I have been weighed down by a problem or a difficulty, I have gone to the House of the Lord with a prayer in my heart for answers. These answers have come in clear and unmistakable ways” (“What I Hope You Will Teach Your Children about the Temple,” Ensign, Aug. 1985, 8). I have a personal testimony of the peace that can be found within the temple and of the ability of the Spirit's whisperings within to wash away the woes and worries of the world outside. I invite you all to seek that peace. If you are not a member, go visit the grounds of a temple. Sit and contemplate your life and your purpose and your desires in that setting with sincerity and you will find answers. Despite Solomon being granted God's wisdom, choice is still a personal matter and later in his years Solomon made some foolish choices. Firstly he took wives that lead him away from his priorities and beliefs. Then he actively built altars and high places for other gods, notably Ashtoreth, Milcom and Chemosh, the gods of the Zidonians, Ammonites and Moabites. How does someone so wise make such foolish decisions? What can we learn from Solomon's sad example in his later years? He is drawn to flattering words and loved many strange women. He did evil in the sight of the Lord.